Read New Internationalist magazine on your Android device. A New Internationalist magazine reader for Australian and international subscribers. Take the New Internationalist social justice magazine with you wherever you are, read it off-line and share articles with your friends even if they're not New Internationalist subscribers. HINT: Take out your subscription from this website and then install the App for your tablet or phone. That way you’ll be able to use your sign-in to access the magazines both on your desktop and on your mobile device App. The New Internationalist is a leading world-wide magazine that brings to life the big issue of our time: action for global justice. We believe in putting people before profit, in climate justice, tax justice, equality, social responsibility and human rights for all. 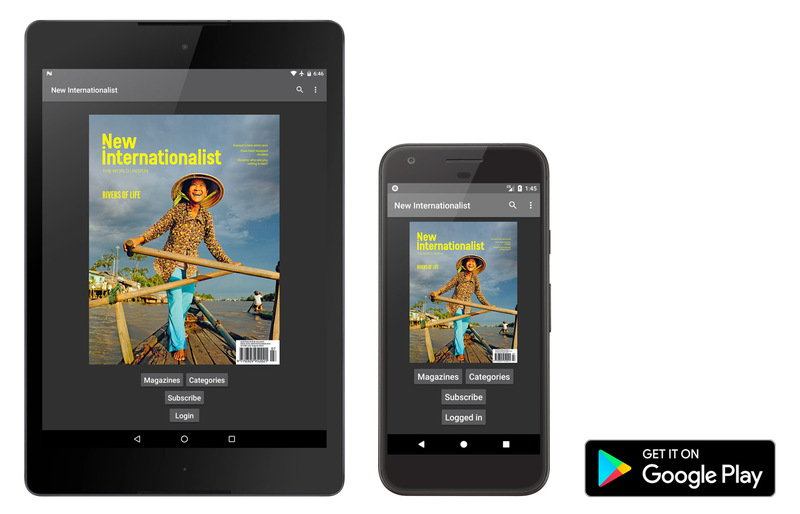 Purchase single copies of New Internationalist magazine via in-app purchases or buy a 12 month or month by month subscription for access to the entire digital archive of magazines. If you already have a subscription to digital.newint.com.au, you can use these login and password details in the Android app too. This app offers purchases of auto-renewing subscriptions to New Internationalist Magazine. The length of the subscriptions offered are 12 months or 1 month. The New Internationalist Magazine is published 10 times a year, with a combined issue in January/February and June/July. A 12 month auto-renewing subscription costs AUD$37.99 (AUD$3.79 per issue). A 1 month auto-renewing subscription costs AUD$4.00. The payment will be charged to your Google Play Account at the confirmation of your purchase. Auto-renew subscriptions are automatically renewed unless auto-renew is turned off at least 24-hours before the end of the current period. Any articles you have read during your subscription will be stored in your Android device for later reading even after your subscription lapses. Accounts will be charged for renewal within 24-hours prior to the end of your current subscription. Renewal costs will be the same as the initial auto-renewing purchase price, AUD$37.99 for 12 monthly auto-renewals, AUD$4.00 for 1 month auto-renewals. All auto-renewing subscriptions come with a free 1 month trial, if you cancel during the first month you will not be billed. Subscriptions may be managed by subscribers and auto-renewal may be turned off by going to the Google Play listing for this app after purchase. You can purchase a single issue for AUD$7.50 each. Single issue purchases never expire. When reading the table of contents or a specific article, tap the share icon on the top right of the screen (it looks like a square with an arrow point upwards). This creates a special 'Guest Pass' and copies it into the share dialog for you to send to friends. Even if your friends aren't subscribers, they will have access to read the articles you share. When on a magazine table of contents, long-tap the cover and a dialog box will appear asking if you'd like to download the full issue. Once it finishes downloading, it will tell you that the magazine is ready for offline reading. 7.2 Any formal privacy-related complaints should be directed in writing to the New Internationalist Privacy Officer, 15 Austin Street, ADELAIDE SA 5000.